- part of a list of introductions to many prominent personalities in the Srimad-Bhagavatam. - Krishna expands Himself into many forms to enjoy unlimited relationships and manage the universe. "In the Vedas it is stated that the one becomes many (eko bahu syam). The Supreme Personality of Godhead expands Himself in various forms — vishnu-tattva, jiva-tattva and shakti-tattva." "Krishna is the original Supreme Personality of Godhead, and Baladeva is Krishna's immediate expansion. . . He is the original source of all incarnations. . . The immediate expansions of the Lord are called svamsha (personal expansions), and there are also expansions called vibhinnamsha (separated expansions)." "In the nineteenth and twentieth incarnations, the Lord advented Himself as Lord Balarama and Lord Krishna in the family of Vrsni [the Yadu dynasty], and by so doing He removed the burden of the world." "The specific mention of the word bhagavan in this text indicates that Balarama and Krishna are original forms of the Lord. . . Lord Krishna is not an incarnation of the purusa, as we learned from the beginning of this chapter. 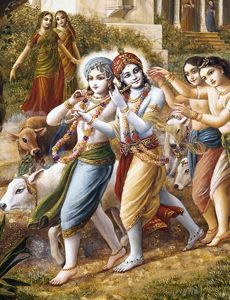 He is directly the original Personality of Godhead, and Balarama is the first plenary manifestation of the Lord." - this purport gives biographical highlights for various important personalities, Balarama among them. - from the book Krishna, the Supreme Personality of Godhead. - from Krishna, the Supreme Personality of Godhead.